Whizz Bang! Pine Burr blocks. Next up in the Whizz Bang! series are the Pine Burr/Pine Cone blocks. Pine Burr or Pine Cone quilts have been described as a three dimensional quilt with overlapping triangles placed in circles starting from the center. 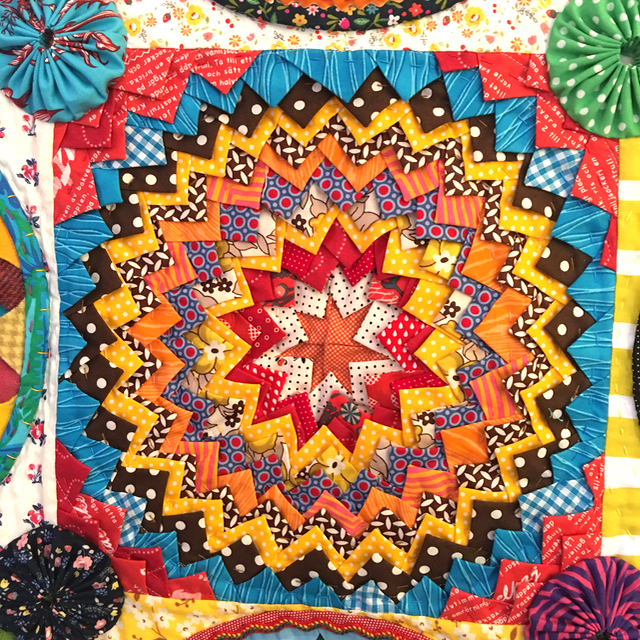 From early to late twentieth century these quilts were popular amongst Southern African American quilters. This style of quilt making was considered masterpiece work as much as fine applique was considered in Caucasian communities. I couldn't find any information about where the idea first originated from or any information earlier than the early 20th century. If anyone knows any more information about Pine Burr or Pine Cone quilts feel free to let me know. I love how electric Pine Burr blocks look. The wonkiness suits them, gives them more movement and makes them look playful. I've been very scrappy in my fabric choices again with these blocks. Yay for red and white polka dots! I played with different ways of making the points. Squares, rectangles, even circles folded different ways, simply to try different methods of making them. You can't tell the difference in the final blocks. Of course a bit of ric rac crept into one of the blocks. 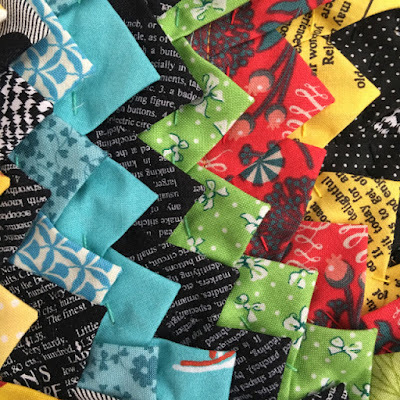 Close up photo of the quilting stitches with perle 8 thread. Reading that list sounds like craziness! It's lucky I get very determined when I have an idea. My Whizz Bang! quilt also has blocks inspired by an old Chinese Quilt but I'll save that story for another day. 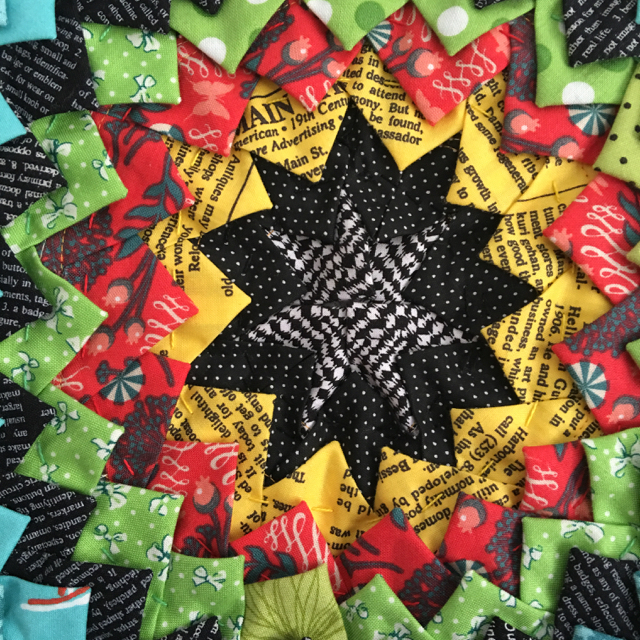 For more Pine Burr goodness pop over here to see an amazing quilt made by LeeAnn of Nifty Quilts. my quilts Pine Burr quilt Pine Cone quilt WhizzBang! great close ups. Your fingers must still be sore. 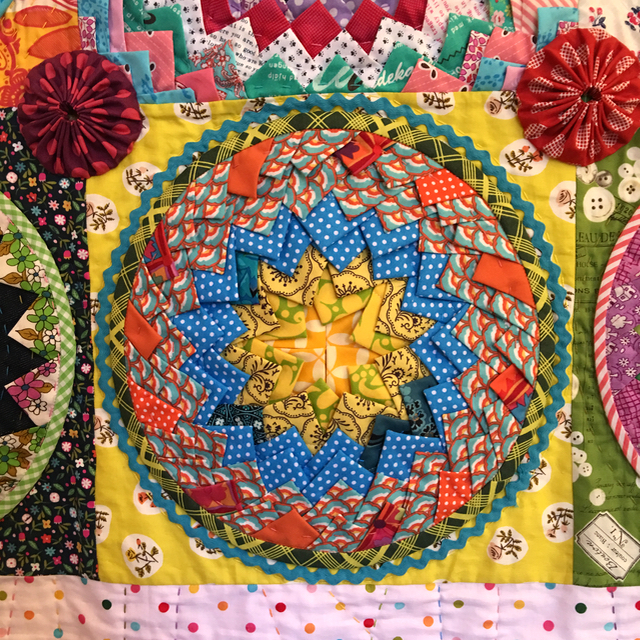 It was fun to revisit LeeAnns quilt too. Funny you were the first commenter on that post. I like the borders they look fun! Thanks for showing the close ups. I love this pattern! May be some day I will make one too. You have churned up that all over again. 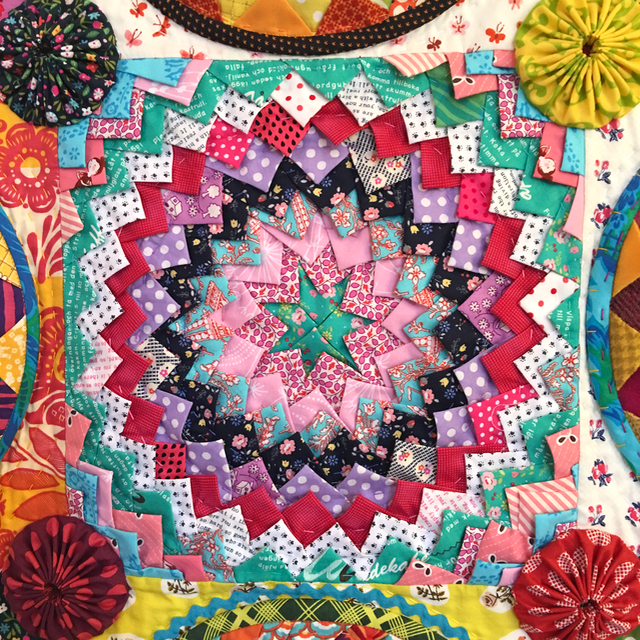 Love love love your wonderful quilt Rachael ! 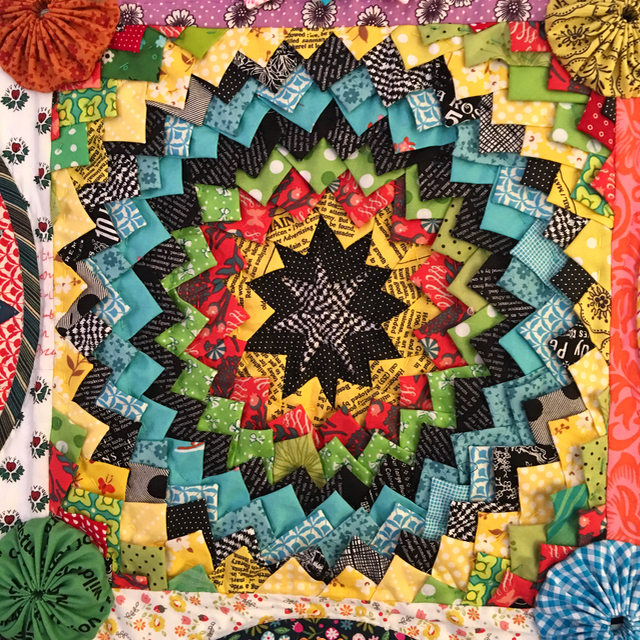 If you want to know more about this block, go into Google and type : miss Sue pine cone quilt. You arrive on a blog named "la ruche des quilteuses" . 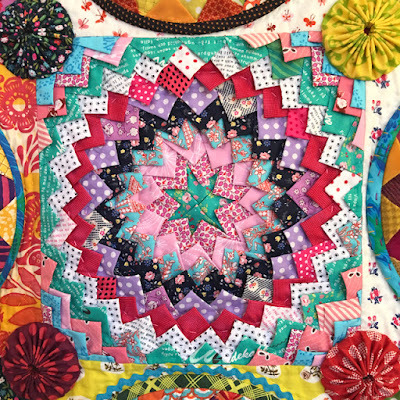 You will have Sue's history and her quilt ! U r such a genius!!! I love seeing the blocks close up--you must have had so much fun choosing the fabrics for each one! Such fun! I have seen a few late 19th century Pine Burr quilts here in New England, but they are pretty rare. They are what my grandmother used to call "chastity quilts". They were so heavy that once you were underneath one, it was difficult to move! Wink! Oh, and they were all made of lightweight wool. That's a lot of work, Rachael. 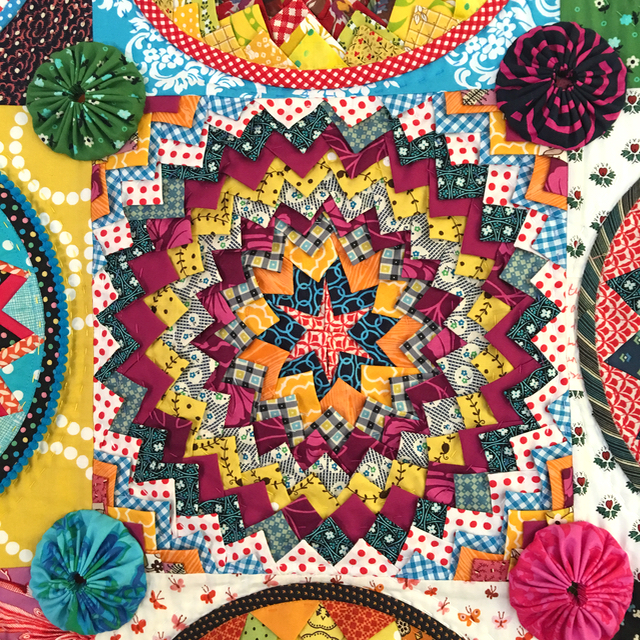 You never cease to amaze me with your perseverance in quilt-making. I enjoyed the post (above) by Wendy Canton Reed about this being a "Chastity Quilt" That is what my grandmother called them also. If I ever make one, the heaviness of it would be enjoyed by my autistic grandson who likes weighted blankets, but this seems like it could be an alternative. I can't imagine washing and drying one though. I am sure in the "old" days they were simply beat with spoons and sticks to clean them. I just adore all of these version of the Pine Burr!! I always feel like a rebel making one, since there isn't any of the traditional piecing. And they're so substantial with all the weight of each folded piece. Worth every minute and very stitch! Your color and print choices are stunning. Love, love, love! Thank you for sharing the pic of your quilt! Stunning! The closeup of the great fabric palette! Incredible!! Thank you for the pine burr closeups! Each one is a riot of color, like a little quilt on its own. Your use of yo-yos on the corners is brilliant. Looking forward to your next installment on this knock-your-socks-off quilt! Thanks Rachael, so very very interesting ...This is the first time I've seen a Pine Burr.....just love it! Oh Rachael you are a ray of sunshine, thank you for sharing your beauties. Now I'm very curious, LOL. I do love the scrappiness and the details. I could look at these photos for hours. Thanks for sharing this goodness! What amazing blocks! Never seen blocks like this before and yours are volcanic eruptions of colour. Don't know how you stitched through so many layers of fabric. Such an interesting post, thank you for sharing. I love how you place your fabrics, the colours are so vibrant yet complimentary next to each other. You are a master of colour and design! 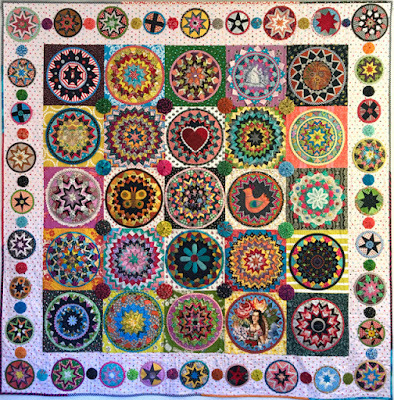 Hi Rachel I met you in Sydney, where your absolutely fabulous quilt won Best of Show. An amazing work of art. Congratulations. I found your blog on Barb's .....Fun with Barb. Its certainly a small world! Your choice of fabrics really make this quilt interesting. I can't imagine how you quilted through all of that! 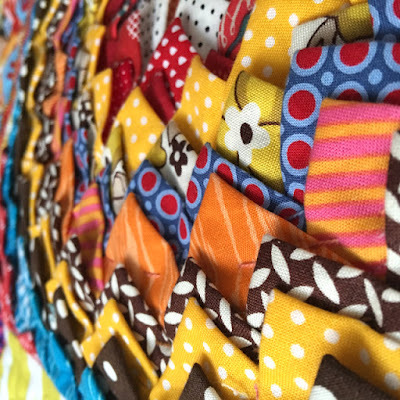 I'm loving reading all about how you made this quilt, I've spent ages all ready just looking at the close ups! Stunning! I do admire your patience. There is so much work in every block and they all look wonderful. Love the history lesson, too. That is the best party ever in fabric form! have always wanted to make a Pine Burr quilt and yours is very seductive. Just fantastic!! !